I’m sure you’ve seen the many recipes for zucchini boats or stuffed zucchini. This recipe is along those same lines, but it is just like a taco… in a zucchini instead of a taco shell. They are easy to make and helps you get in those extra veggies! If the men in your house are anything like my husband, these might not quite fill them up, or only hold them for a short while. To fill those man tummies, try serving these tacos with a rice dish like Wild Rice-a-Roni! Keep your eyes posted for other cool summer recipes that do not use the oven! Cut the zucchinis in half length-wise. Scrape out the centers, where the seeds are, squeeze the water out and set them aside. Drop the zucchinis in the boiling water and let them cook for 1 minute. Remove the zucchinis and pour the water out from their centers. Cook the ground beef and jalapeno on medium-high until browned. Add the zucchini centers (set aside previously) taco seasoning, garlic powder, tomato and half of the salsa. Saute for 3 minutes, to combine the flavors. Put the remaining half of the salsa in a ceramic dish (one that will fit in your microwave) and spread it to coat the bottom. 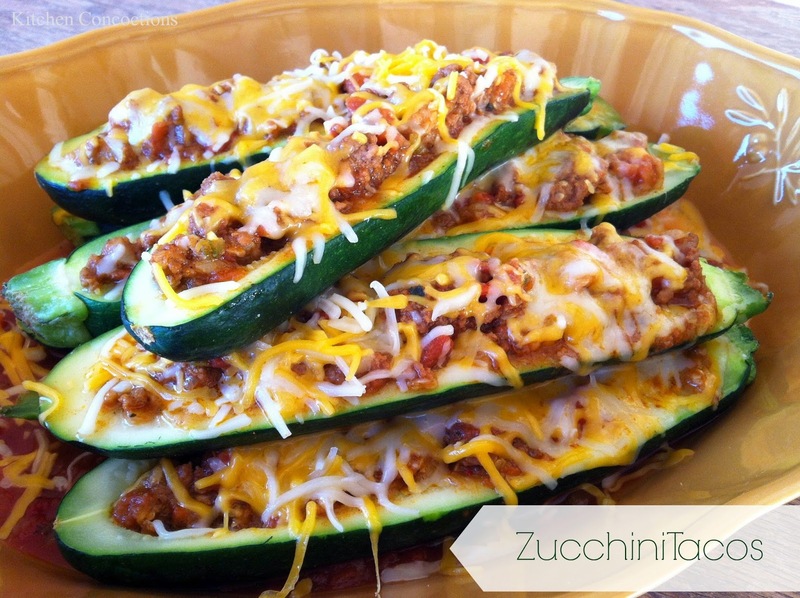 Fill each zucchini with the taco filling and lay them in the dish. Cover the zucchini tacos with cheese. Microwave for 3 minutes, or until the cheese is bubbly and the tacos are steaming.